Demographic Information: Patient is a 31 year old pregnant female. Previous care or treatment: Patient has received physical therapy in the past for an injury sustained while running however, she has never received treatment for her present symptoms. Patient is a 31 year old pregnant woman. Patient presents to physical therapy complaining of generalized mid-thoracic and upper cervical pain. Patient reports no recent falls or trauma. However, she is petite and four months pregnant and believes that the additional pregnancy weight is pulling her upper thoracic spine and shoulders are being into a rounded position. When questioned about her pain, the patient reports that by the third month of her pregnancy, she started to notice the achy, sore pain when she would be sitting at her desk at work. The patient does not believe any activities make the pain worse, but sitting upright in her desk chair at home provides some relief. In addition, she is fearful of using ibuprofen because of the effects it may have on her unborn child, so she uses a heating pack at night to decrease her symptoms. The patient was questioned further about the nature of her work and workspace. Currently, the patient is the marketing director of a large business. She works long, stressful hours at her desk. 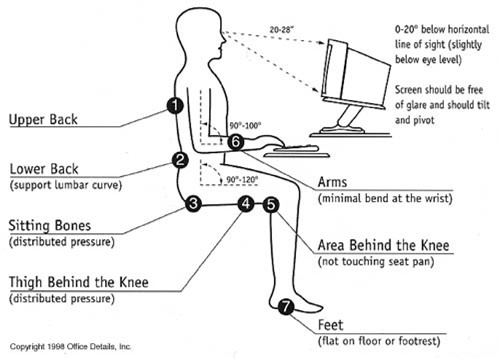 The patient describes how her chair does not accommodate her height well, so often she finds herself leaning forward a lot throughout the day in order to get close enough to the monitor and rest her feet on the ground. Recently, the patient has been increasingly stressed at work because she is behind schedule with multiple upcoming project deadlines. The therapist asks the patient if she has noticed any other changes lately that could be increasing the stress. The patient reports that in the past few weeks, the patient reports that she has also started to experience severe throbbing headaches on the right side of her forehead and above the ear. Soon after the headache begins, she finds that she becomes very nauseous and occasionally gets dizzy. When asked about the nature of the dizziness, the patient reports that it lasts only as long as the headache, and does not increase with changes in position. The patient believes that her pregnancy has been causing the nausea, but she is concerned with the headaches because they are often so strong and painful that she cannot get any work done. When questioned further, the patient goes on to describe how the sunlight from her large window and staring at her screen makes the headache much worse, and sometimes even causes some ringing in her ears. In addition, the patient believes the glare on her computer may be the cause of her headache because she starts to see bright spots on the screen prior to the onset of the headache. Often, the pain is so extreme that she must leave work early to go home and rest. Normally, after sleeping an hour or two, the pain subsides. The patient is distressed because the prolonged back and neck pain, with the addition of the severe headaches have prevented her from fully participating in work and social activities. • Thoracic/ Lumbar Extension: 18 degrees, some discomfort reported. Reproduction of reported tenderness with palpation along spinous processes of T1-T6 and superior medial border of bilateral scapulae. Tenderness of pectoralis minor reported noticeable bilateral shoulder protraction secondary to tight musculature. Single Limb Stance Eyes Closed: 12 seconds, trunk deviation to the left. Nystagmus: Minimal nystagmus present at end range. Based on the patient’s report of symptoms, I would want to determine several things. I would want to determine which symptoms and pains were of musculoskeletal origin and whether they were related in cause. Especially since she is pregnant, I would want to be very aware of potential yellow and red flags. Since her thoracic/scapular pain can be relieved by position, I would begin leaning towards a musculoskeletal origin. A potential cause of this pain area may be connected with her posturing at work combined with the physical stress of pregnancy. I would also want to further investigate her complaints of dizziness. Due to the lack of positional changes causing changes in the patient’s symptoms, I am leaning towards headache related vertigo rather than BPPV. A Dix Hallpike test could hep further confirm this inclination. Regarding her headaches, I would use pain type, relieving factors, triggers, type of onset, duration of symptoms, associated symptoms, and effect of sleep to help with differentiating between cerviogenic, tension, migraine, and cluster headaches. My primary clinical impression would be a migraine due to the accompanying symptoms of nausea and photophobia. 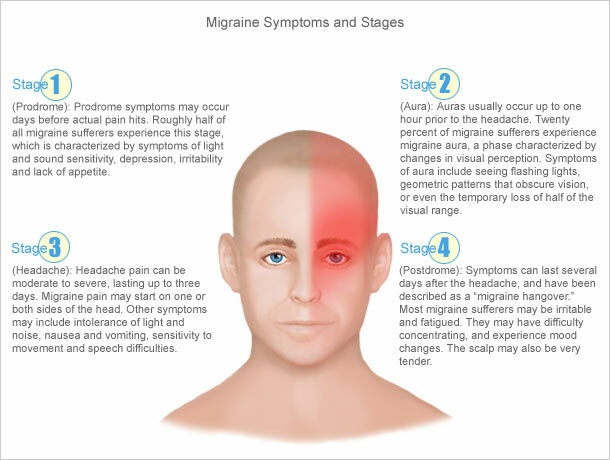 A migraine is characterized by a unilateral pulsatile pain accompanied by nausea and sensitivity to light and sound. The pain can last between 4-72 hours and is lessened after sleeping. Sometimes, an aura accompanies a migraine which involves fully reversible visual, sensory, or dysphasic speech disturbances. The spots described by the patient preceding the headaches could be attributed to an aura associated with a migraine. A cervicogenic headache is typically non-throbbing and accompanies limitations in cervical ROM which were not experienced by the patient. To assist in ruling out cervicogenic headache, the therapist can apply pressure to the upper cervical or occipital region and cause symptom exacerbation. It is difficult to distinguish between a cervicogenic headache and a migraine and the two can occur simultaneously. Women are more likely to experience this type of headache, especially with concurrent findings of poor posture. The average age of onset is 42 years which is older than our patient but used alone would not be enough to rule out this diagnosis. Both cervicogenic and migraine headaches are typically unilateral. 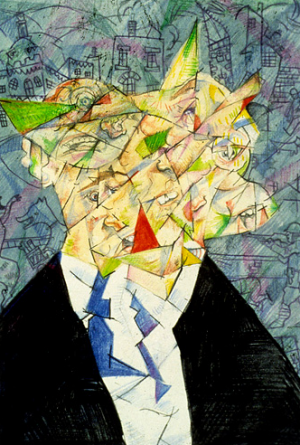 Cluster headaches would be a much less likely diagnosis consideration based on the lack of typical associated autonomic symptoms, and the report of sleep lessening the pain. Cluster headaches are also typically males between the ages of 20-40. The pain is typically sharp, pulsating, or pressure. Pain is commonly unilateral temporal or periorbital pain that lasts from 15 minutes to 3 hours and typically occurs with other autonomic symptoms. Repeated occurrences of cluster headaches can occur in the same day. Common associated symptoms include ipsilateral conjunctival injection, lacrimation, nasal congestion, rhinnorrhea, eyelid edema, forehead and facial swelling, miosis, and ptosis. It occurs suddenly and often reappears at similar times each day. A cluster headache will improve with activity while a migraine can worsen. A cluster headache could occur during sleep while a migraine typically is relieved or lessened with sleep. Cluster headaches are often associated with comorbitities such as depression, sleep apnea, restless leg syndrome, and asthma. Although muscle tension is most likely present in this patient due to her posturing at work and otherwise, a tension headache is less likely to be the correct classification for this patient because a tension headache is typically described as bilateral mild to moderate pressure and does not have associated symtoms. Since our patient presents 4 months pregnant our primary goal is to help her deal with the migraines without medical interventions. Current research support the use of physical therapy programs targeting vestibular rehab to improve migraine symptoms such as vertigo and dizziness. Although research supports the use of vestibular physical therapy programs, there are discrepancies when it comes to conducting vestibular rehabilitation with or without the use of medication. Many studies have reported these improvements in symptoms come with the use of a combination of vestibular rehab and pharmacological therapy. For instance, Johnson et al found subjective improvements in symptoms in 92% of patients who received this treatment combination. He also found 85% of patients reported a decrease in aural fullness symptoms, 63% reported a decrease in ear pain and 89% reported a decrease in phonophobia. Other studies have found that the use of prophylactic medication to treat the migraine did not affect the outcomes of vestibular physical therapy. More research is needed to determine the role of these medications as well as the scheduling of medication use around physical therapy. In most cases, the exact prognosis of patients with migraines and dizziness will depend on the exact cause of the migraine, use of medication and other comorbidities that may impact treatment results. One-half of the adult population worldwide is affected by a headache disorder. Migraines and Cluster headaches fall under this umbrella, with migraines having a much higher prevalence. As physical therapists, we will experience patients who are affected by multiple comorbidities that will influence their plan of care. We may not focus our treatment solely on the headache, but we must consider the impact it can have on their treatment. We will want to address all impairments to the extent that we are qualified due to the overall affect they can have on our patient’s quality of life. A knowledge of the various headache disorder presentations will help determine which patient’s symptoms fall within our scope of practice. We need to have an understanding of the various factors that can contribute to a patient’s head pain and to what extent we can impact these. As we treat other impairments, a patient’s headache and related symptoms could be impacted. Headaches can impact posture, balance, gait, and overall quality of life. A multidisciplinary approach is needed to ensure optimal patient care. Any medical professional involved in the patient’s care should be included in the treatment plan. We can do our part by addressing the musculoskeletal and neurological deficits that fall within our scope. Spinal manipulation, modalities, exercise therapy, thermal biofeedback, neuro feedback, lifestyle modifications, relaxation techniques, acupuncture, massage are all treatment options discussed in current literature. As the profession evolves and research expands, newer techniques such as dry needling may provide promising opportunities to increase our impact for headaches and related disorders. [Healthcare behavior of migraine and headache patients when treatment is accompanied by the digital migraine app]. ↑ 1.0 1.1 1.2 1.3 1.4 1.5 1.6 1.7 1.8 Hainer BL, Matheson EM. Approach to Acute Headache in Adults. Am Fam Physcian. 2013 May; 87(10): 682-687. ↑ 2.0 2.1 2.2 2.3 Biondi DM. Cervicogenic Headache: A Review of Diagnostic and Treatment Strategies. J Am Osteopath Assoc. 2005 April; 105(4):S16-S22. ↑ 3.0 3.1 Weaver-Agostoni J. Cluster Headache. Am Fam Physician. 2013 July; 88(2): 122-128. ↑ 7.0 7.1 7.2 7.3 7.4 7.5 7.6 Biondi D. Physical Treatments for Headache: A Structured Review. Headache.2005 Jun;45(6):738-46. ↑ 8.0 8.1 8.2 Chaibi A, Tuchin PJ, Russell MB. Manual Therapies for Migraine: A Systematic Review. J Headache Pain. 2011 Apr;12(2):127-33. ↑ 9.0 9.1 9.2 9.3 9.4 9.5 Vernon H, McDermaid C S, Hagino C. Systematic review of randomized clinical trials of complementary/alternative therapies in the treatment of tension-type and cervicogenic headache. PubMed . 2002 Feb [cited 2015 Mar]. Available from: http://www.crd.york.ac.uk/CRDWeb/ShowRecord.asp?AccessionNumber=12000003174#.VQyOvEtgNuY. ↑ Smitherman TA, Burch R, Sheikh H et al. The prevalence, impact, and treatment of migraine and severe headache in the United States: A review of statistics from National Surveillance Studies. Headache. 2013 Mar; 53(3): 427-36.